Breast augmentation patients come to Dr. Augenstein in Charlotte, NC, for natural-looking results that enhance their figures. Every patient is unique, with specific experiences, needs, and expectations that help shape their views of themselves. Fortunately, for patients who would like to see themselves with enhanced breasts, today’s breast implant options allow them to select both the shape and size they would prefer. Whether you have lost volume and shape due to pregnancy, aging, or weight loss, or you are merely pursuing the shape and size you believe you were always meant to have, Dr. Adam C. Augenstein can help you achieve your happiest, healthiest, most confident self. The best method for determining whether you are a good candidate for breast implants or an alternative breast enhancement procedure is to discuss your needs and concerns with Dr. Augenstein. Consultations typically last about 45 minutes to an hour and can help you understand your treatment options and feel confident about making the best decision for yourself. Some factors increase the likelihood of patient satisfaction with a breast augmentation procedure. Specifically, patients should be fully developed and physically healthy to ensure the least amount of downtime following their procedure. Our goal is for you to leave our facility feeling confident and pleased with the results. Unlike some body contouring treatments, which can can take several weeks or even months to fully materialize, breast augmentation produces visible changes almost immediately. Our patients love their fuller, curvier figures and can see positive results as soon as they have finished healing. We will walk you through every step of your procedure prior to surgery, which should last about an hour, depending on your surgical plan. You will be given general anesthetic to ensure your comfort and safety while your procedure is performed. You will be able to return home the same day, although we do monitor our patients immediately following surgery. 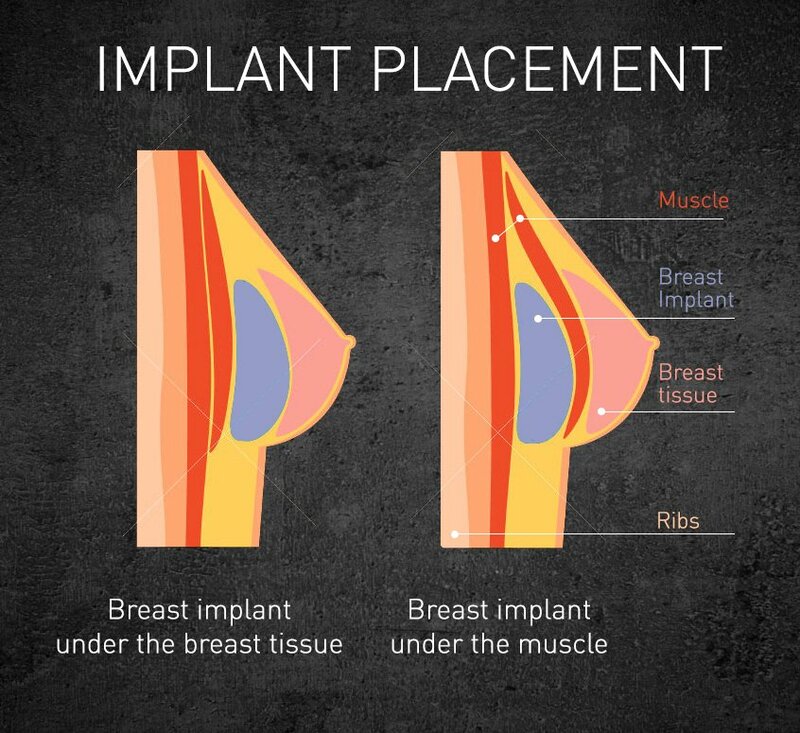 Where your breast implants are placed depends on your anatomy, preferences, and choice of implant type. Dr. Augenstein can place the implant either directly under the breast tissue (on top of the pectoral muscle) or directly under the pectoral muscle. Because there are so many different breast implant options–from the many types of breast implants to your own fat–you can get exactly the shape, size, and consistency you want with the help and guidance of Dr. Augenstein. The most popular choice due to their durability and natural feel and look. Are cheaper and the saline is harmlessly absorbed by the body in case of rupture. Dr. Augenstein is one of the few plastic surgeons to offer fat transfer breast augmentation in Charlotte, NC. This technique requires fat deposits to be collected from a selected portion of your body, purified, and transferred to your breasts. Immediately following your breast augmentation, you will probably have some soreness and swelling. This is normal and can be managed with pain medication. Some women express concern that their breasts look larger than expected, but this is usually due to post-surgical swelling, which is very common and temporary. Once the swelling has subsided and the implants have settled into position, our patients are extremely pleased with their results. In the initial weeks following your procedure, you will wear a post-surgical support bra. In addition to a gentle surgical technique, following aftercare instructions is the best method for ensuring a rapid recovery. You should be able to return to work and resume your normal routine within 1 week, but you will need to avoid exercise and strenuous activity for several weeks following your breast augmentation procedure. Following your procedure, you will be given precise, detailed instructions regarding medications and follow-up consultations. We encourage you to contact us with any questions or concerns at any point in the process. Breast augmentation procedures are some of the most commonly performed cosmetic treatments, with hundreds of thousands of women choosing to get breast implants each year in the United States. As with any medical procedure, there are risks, making it vital that you choose an experienced and board-certified plastic surgeon to perform your breast augmentation. There are certain steps that you can take to help ensure the success of your breast augmentation procedure and speed of your recovery. Specifically, we may ask you to modify your medications leading up to the procedure, including avoiding aspirin and other anti-inflammatory drugs that may increase bleeding. Avoiding smoking in the weeks leading up to and after your breast augmentation is also advised. Yes. Breast augmentation is safe for patients who would like to breastfeed, and safe for your child. If properly performed, your breast augmentation should not interfere with your ability to produce or deliver breast milk to your baby. According to RealSelf.com, breast augmentation cost in Charlotte, NC, ranges from $4,500 to $8,000. Just as there are many different approaches to breast enhancement, breast augmentation costs vary based on the type of procedure and breast implants you choose. We want our patients to feel confident that they understand every technical, as well as financial, aspect of their care–and Dr. Augenstein will discuss the various procedures and prices while developing your specialized treatment plan. It is important to note that while different facilities may charge different fees for a breast augmentation operation, it is essential to take your doctor’s experience, expertise, demeanor, and education into account when making this life-changing decision. Can I combine other procedures with breast augmentation? Yes. A breast augmentation is frequently performed with or as part of a mommy makeover. This treatment usually includes breast implants and/or a breast lift with liposuction and/or a tummy tuck to reduce saggy skin and tighten lax abdominal muscles. Each of these procedures can also be performed alone. Schedule an appointment today by calling or request your consultation online. Dr. Augenstein is regarded as one of the best breast augmentation surgeons in Charlotte, NC. Our Charlotte cosmetic surgery team is dedicated to providing our patients with safe treatments and amazing results. Dr. Augenstein and his staff are absolutely incredible. Dr. Augenstein and his staff are absolutely incredible. They go above and beyond to make you feel comfortable and at ease. I am so pleased with the results and fully trust Dr. Augenstein. I highly recommend their office.